If you log out from Facebook and check a public profile you will see that users often forget to make their fan pages hidden they have given a like before. Although, beside the person’s name and this information nothing else seems to be publicly shared, this is still very good for us for a start. So for instance, if we are sourcing for MBA professionals from INSEAD it is now an easy way to see who has liked any of the INSEAD MBA fan pages. We can use this string and it will bring a very good amount of professionals who have got an interaction with this Uni. 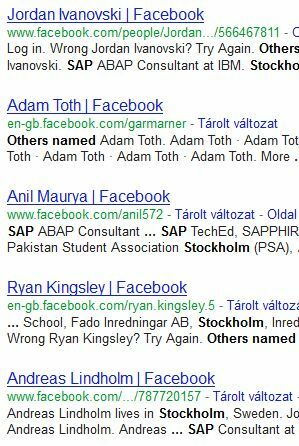 You may add “others named” to your string to narrow the search results only to user profiles. It brings only those fans who let their fan pages be visible on the web. This string is built upon the assumption that one likes a page because they have got a story (or history) with that. It can be though only their interest. You can more narrow your results by adding new keywords. For example, this can be a string for INSEAD MBA guys from France. The same logic is applied here as above but we are now x-raying a combination of fan pages a person has liked. The assumption is that if I am local to Stockholm (Sweden) and an SAP professional I may look for and like pages from both of these areas of my life – correct? By adding these keywords to a string I can get profiles who most seem to match my requirements. People often like sport clubs, restaurants, movies and so which title may contain the given keywords (e.g. Stockholm FC) – certainly it can bring you fake results as well. You can use this string to see what your candidate liked and/or commented. Do a more engaging conversation with your candidates knowing a lot about their interest and language. Please note... that you can always use the cached content which will highlight your candidate’s name on a page. Sourcers cannot be grateful enough for Facebook boosting the Fan Page activity. I am sure we will see soon loads of new tricks and ways how to retrieve even more human capital data. Should you have anything to share with the world please leave a comment below. Thanks for reading it! Such a great post, thank you @thebalazs! Great post! But I can’t open you strings. Please advise. Julie – whats going wrong with the strings? The first one is the below one please add it to Google. When I click on the “string” link to open it up, it won’t. Thanks.